Posted on Fri, Aug 26, 2011 : 12:17 p.m.
Michigan basketball coach John Beilein is looking forward to moving into the Player Development Center in October. Michigan basketball coach John Beilein sits in his makeshift basketball office each day surrounded by boxes, loose papers, cramped hallways and the sound of construction. He uses a piece of cardboard as a curtain to block out the sun -- "You should have seen the glare before," he notes -- and parks on a patch of gravel in front of the moving trailers affectionately known as "Crisler Estates." But in these estates, there is no anger. Just smiles and excitement for what will soon be a new reality for Michigan basketball. "We had the artist's rendering, then we had the virtual tour -- and we're all tired of the virtual tour," Beilein said, laughing. "And now, we're weeks away from the actual tour, and we can't wait." Beilein and his basketball program are on the verge of a new era. Not just on the court, as the Wolverines made their second NCAA Tournament appearance in three years in 2010-11, but on a much larger scale. Michigan is scheduled to move into its new $23.2 million Player Development Center in mid October. The PDC is a facility that will house the men's and women's basketball offices, locker rooms, practice courts, strength and conditioning facilities and a tunnel to the revamped Crisler Arena (which will have its $20 million first-phase renovation facelift completed early in September). It's an upgrade that Beilein says he's waited for since taking the Michigan job -- a position he says he's not giving up any time soon -- in 2007. "This is something we've pushed for since my first year here," he said. "The facilities of the Big Ten are so outstanding compared to all the other conferences, top to bottom. As a result, we needed to catch up. That catching up part has been huge. It's made for efficiency. "Our offices used to be at Hoover and State. The kids would virtually bypass us to get to where they needed to be. And now, they're going to walk right by us every day -- and that's huge with the building of relationships. Now, we'll have much more access to them in areas off the basketball court." On the floor, the Wolverines also appear capable of remaining an NCAA tournament-worthy team. Michigan returns 12 players who saw game action last season. Despite losing their leading scorer in point guard Darius Morris (who left school early for the NBA), the Wolverines will bring back five players who appeared in all 35 games last season in Tim Hardaway Jr., Jordan Morgan, Zack Novak, Stu Douglass and Evan Smotrycz. And another, Matt Vogrich, who played in 34. The future isn't looking so bad, either. 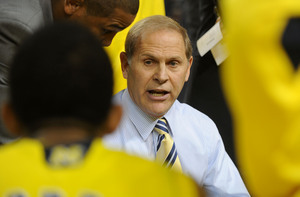 Beilein's current two-man 2012 recruiting class of Glenn Robinson III and Nik Stauskas was ranked by ESPN.com at No. 14 in the country earlier this week. His early returns for the class of 2013 have been well-received also, as he's snagged pledges from Rivals.com four-star small forward Zak Irvin, as well as three-star prospects Derrick Walton, Mark Donnal and Austin Hatch. In addition, 2012 forward/center recruit Mitch McGary -- a consensus top-five player nationally -- is scheduled to make an on-campus visit Sept. 3. But with all the recent buzz, Beilein said it’s important not to jump too far ahead. "The only way that you can reach the very top of the (college basketball) world -- the Final Four -- is consistency," he said. "You have to consistently be in the NCAA Tournament, consistently toward the top of the Big Ten in order to go after the biggest prize. "When Michigan had to re-tool in many ways back in the mid-90s, they had to go in different directions and do some different things. At that time, Wisconsin popped up. Other teams started re-doing facilities. It wasn't like everybody else said, 'Oh, hey, Michigan wants to come back -- it's their turn. That's not happening. We need to continue to establish a culture that breeds winning and a championship attitude." How does Beilein define "championship attitude?" By proving that the Wolverines deserve the move from the parking lot into the penthouse. "I know we're moving in the right direction, but I don't doubt for a second that every other program out there isn't doing the exact same thing,” Beilein said. “There's 12 of us in the league, and to get to the NCAA Tournament and get that consistency, half of us will make it and half of us won't. "Which half are we going to be? That's how we have to approach it." Thu, Sep 1, 2011 : 2:36 p.m. This facility is LONG overdue and will pay immediate dividends. In fact, I'm guessing that it's already helping us to sign better players. I'm sure in recruiting a kid like McGary, it is really important to be able to show that we have elite-level facilities especially when he goes to see schools like Duke and NC who already have them. Thu, Sep 1, 2011 : 2:59 p.m.
You hit it right on the head, 81. Facilities are huge in today's recruiting world – and if you have to ship players to four different corners of campus to do four separate things, you've got a problem. Also, the fact that the facilities are nearly done is a big help – that way, you can show potential recruits an actual building, and not a pile of dirt/concrete with a sketch of what's to come. Fri, Aug 26, 2011 : 6:26 p.m.
Mr Blue None. The athletic department raised the money. Fri, Aug 26, 2011 : 6:13 p.m.
How much money are taxpayers spending for his new digs? I bet they're nicer than a lot of people's homes.